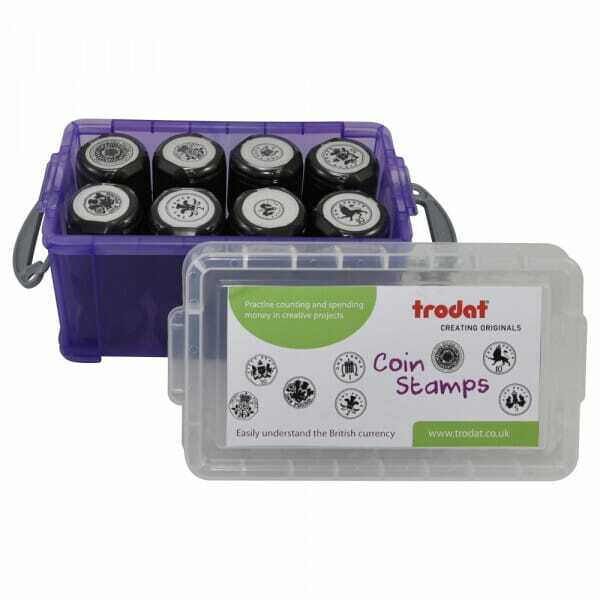 Trodat's set of coin stamps includes 8 stamps that print images of Pound Sterling coins (1p, 2p, 5p, 10p, 20p, 50p, 1 pound, 2 pounds). The stamps are self-inking stamps, Trodat's Printy 4630, which means that no separate ink-pad is required as it is built-in. This ensures that there will be no messy hands among the children who use these coin stamps. The stamps will last a lifetime as replacement ink-pads are available (order no 6/4360). The stamp creates a perfect image every time ensuring that they are the perfect alternative to using real coins. The coin stamp set is sold in a box, ideal for storing the stamps and keeping the set together. The round printed impression has a diameter of 30 mm. Customer evaluation for "Set of 8 Pound Sterling Coin Stamps"